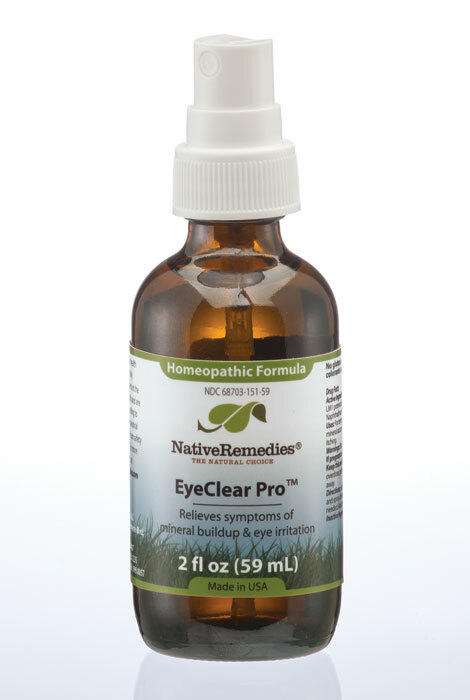 NativeRemedies® EyeClear Pro™ helps relieve symptoms of mineral buildup and eye irritation. Homeopathic oral spray can be used to relieve cloudy vision, the appearance of dark spots and corneal ulcers, redness, itching, watering, light sensitivity, fatigue and feelings of pressure. Pump contains 2 fl. oz. Made in USA. All Native Remedies homeopathic products and biochemic tissue salts are manufactured in a FDA-registered and cGMP-compliant pharmaceutical facility under the supervision of qualified homeopaths and responsible pharmacists. Individual ingredients are listed in the Homeopathic Pharmacopoeia of the United States (HPUS). *These statements have not been evaluated by the Food and Drug Administration. This product is not intended to diagnose, treat, cure or prevent any disease. Initially, depress pump until primed. Hold close to mouth and spray directly into mouth. Use 3 times daily. Use additionally as needed. Adults: 3 pump sprays; Children 2-12: 2 pump sprays. Have tried other eye drops, and was dissatisfied, would like to see if this was different. Used it a long time ago and just didn't get around to reordering it. To try something natural for my problem with dry eye and itching. And I am hoping this works! It seems to help my cataracts. I have watering eyes. I hope this products can help me.